TYPO3 is known for its extensibility. To really benefit from this power, a complete documentation is needed: "TYPO3 Explained" aims to provide such information to everyone. Not all areas are covered with the same amount of detail, but at least some pointers are provided. The document does not contain any significant information about the frontend of TYPO3. Creating templates, setting up TypoScript objects etc. is not the scope of the document, it addresses the backend and management part of the core only. The TYPO3 Documentation Team hopes that this document will form a complete picture of the TYPO3 Core architecture. It will hopefully be the knowledge base of choice in your work with TYPO3. This document is intended to be a reference for TYPO3 CMS developers and partially for integrators. The document explains all major parts of TYPO3 and the concepts. Some chapters presumes knowledge in the technical end: PHP, MySQL, Unix etc, depending on the specific chapter. The goal is to take you "under the hood" of TYPO3 CMS. To make the principles and opportunities clear and less mysterious. To educate you to help continue the development of TYPO3 along the already established lines so we will have a consistent CMS application in a future as well. And hopefully this teaching on the deep technical level will enable you to educate others higher up in the "hierarchy". Please consider that as well! Many of the code examples found in this document come from the TYPO3 Core itself. Quite a few others come from the "styleguide" extension. You can install it, if you want to try out these examples yourself and use them as a basis for your own extensions. If you find an error in this manual, please be so kind to hit the "Edit me on GitHub" button in the top right corner and submit a pull request via GitHub. Alternatively you can just report an issue on GitHub. Local Editing and Rendering with Docker : If you are experienced with Docker and Git you can edit and render locally. Find out more in Local Editing and Rendering with Docker. If you are currently not reading the online version, go to https://docs.typo3.org/typo3cms/CoreApiReference/. Maintaining high quality documentation requires time and effort and the TYPO3 Documentation Team always appreciates support. If you want to support us, please join the slack channel #typo3-documentation on Slack (Register for Slack). And finally, as a last resort, you can get in touch with the documentation team by mail. This manual was originally written by Kasper Skårhøj. It was further maintained, refreshed and expanded by François Suter. The first version of the security chapter has been written by Ekkehard Guembel and Michael Hirdes and we would like to thank them for this. Further thanks to the TYPO3 Security Team for their work for the TYPO3 project. A special thank goes to Stefan Esser for his books and articles on PHP security, Jochen Weiland for an initial foundation and Michael Schams for compiling the content of the security chapter and coordinating the collaboration between several teams. He managed the whole process of getting the Security Guide to a high quality. I want to dedicate this document to the people in the TYPO3 community who have the discipline to do the boring job of writing documentation for their extensions or contribute to the TYPO3 documentation in general. It's great to have good coders, but it's even more important to have coders with character to carry their work through till the end - even when it means spending days writing good documents. Go for completeness! This manual covers many different APIs of the TYPO3 CMS Core, but some other documents exist which cover more specific aspects. TCA is the backbone of database tables displayed in the backend, it configures how data is stored if editing records in the backend, how fields are displayed, relations to other tables and much more. It is a huge array loaded in almost all access contexts. A detailed insight on TCA is documented in the TCA Reference. Next to a small introduction, the document forms a complete reference of all different TCA options, with bells and whistles. The document is a must-read for Developers, partially for Integrators, and is often used as a reference book on a daily basis. TypoScript - or more precisely Frontend TypoScript - is used in TYPO3 to steer the frontend rendering (the actual website) of a TYPO3 instance. It is based on the TypoScript syntax which is outlined in detail here in this document. Frontend TypoScript is very powerful and has been the backbone of frontend rendering ever since. However, with the rise of the Fluid templating engine, many parts of Frontend TypoScript are much less often used. Nowadays, TypoScript in real life projects is often not much more than a way to set a series of options for plugins, to set some global config options, and to act as a simple pre processor between database data and Fluid templates. Still, the TypoScript Reference reference document that goes deep into the incredible power of Frontent TypoScript is daily bread for Integrators. While Frontend TypoScript is used to steer the rendering of the frontend, TSconfig is used to configure backend details for backend users. Using TSconfig it is possible to enable or disable certain views, change the editing interfaces, and much more. All that without coding a single line of PHP. TSconfig can be set on a page (Page TSconfig), as well as a user / group (User TSconfig) basis. TSconfig uses the same syntax as Frontend TypoScript, the syntax is outlined in detail here in this document. Other than that, TSconfig and Frontend TypoScript don't have much more in common - they consist of entirely different properties. A full reference of properties as well as an introduction to explain details configuration usage, API and load orders can be found in the TSconfig Reference document. While Developers should have an eye on this document, it is mostly used as a reference for Integrators who make life as easy as possible for backend users. For most people TYPO3 is equivalent to a CMS providing a backend for management of the content and a frontend engine for website display. However the core of TYPO3 is natively designed to be a general purpose framework for management of database content. The core of TYPO3 CMS delivers a set of principles for storage of this content, user access management, editing of the content, uploading and managing files, etc. These principles are expressed as an API (Application Programming Interface) for use in extensions which ultimately add most of the real functionality. So the core is the skeleton and extensions are the muscles, fibers and skin making a full bodied CMS. 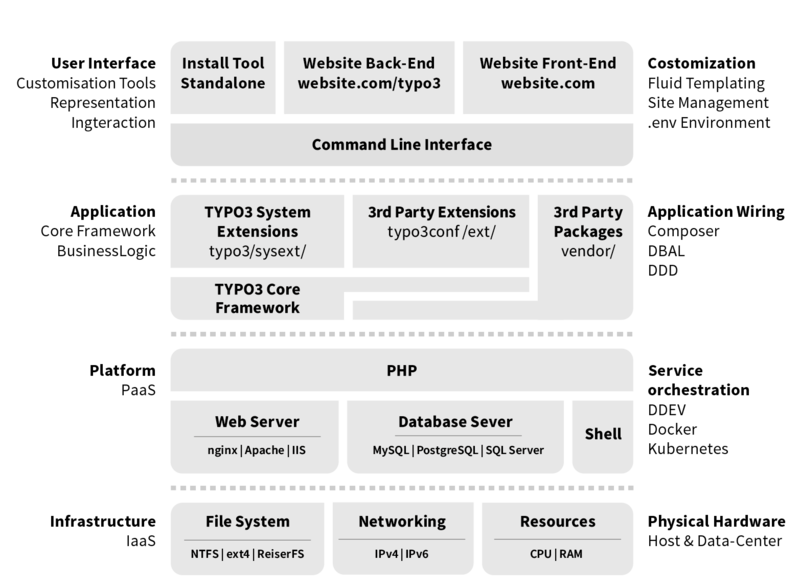 In this document I cut to the bone and provide a detailed look at the core of TYPO3 CMS including the API available to the outside. This is supposed to be the final technical reference apart from source code itself which is - of course - the ultimate documentation. 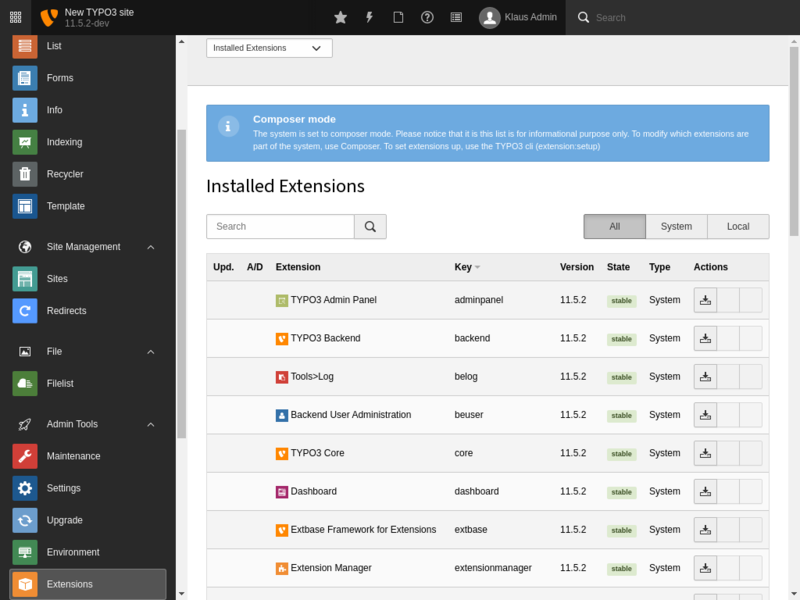 To follow this document, it might help to have a totally trimmed down installation of TYPO3 CMS with only the core and the required system extensions at hand. The installation process is covered in the Installation and Upgrade Guide. You should perform the basic installation steps and not install any distribution. This will give you the "lightest" possible version of TYPO3 CMS. Log into your basic installation and move to the ADMIN TOOLS > Extensions module. You will see all extensions which are loaded by default. Required extensions are not only loaded by default, they have no "Activate/Deactivate" button, too. The most important thing to note for now is that everything is an extension in TYPO3 CMS. Even the most basic functions are packaged in a system extension called "core".